Clyde A. Harbin Sr. *** Having his picture made At the Bass Pro Outdoor World Classic February 27, 1997. This was one of the five boards placed throughout this sporting event. The Heddon Historical Footprints Book by Clyde A. Harbin Sr. *** I want to make a special note on this book because above any book I have read on antique lures this well researched, fact filled book is deserving of special recognition. Clyde A. Harbin Sr. (The BASSMAN) has traveled hundreds of miles and met with the remaining members of the Heddon and Stokes family to piece together the puzzle for the Heddon company. The BASSMAN Books by Clyde A. Harbin Sr.
Heddon Historical Footprints by Clyde A. Harbin Sr. *** I highly recommend this book for all Heddon collectors. The famous BASSMAN TM has assembled his lifetime of experiences and vast knowledge in this book. Clyde Harbin is the nation's foremost authority on antique fishing lures and has over thirty years of research on the Heddon family and company. ** Krause Publications have purchased Clyde A. Harbin's Copyrights for this book. 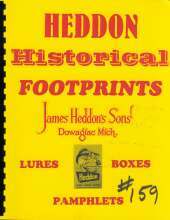 <<< Heddon Historical Footprints Book Owners click here or the cover and receive your special postscript Gift from Mr. Clyde A. Harbin Sr.
James Heddon's Sons Catalogs by Clyde A. Harbin Sr. *** Excellent book for advanced Heddon collectors. This book covers over fifty years of lures. It was compiled and published in 1977 by Clyde Harbin Sr. It contains copies of Heddon catalogs dating from 1903 to 1953 complete with lures, rods and reels. 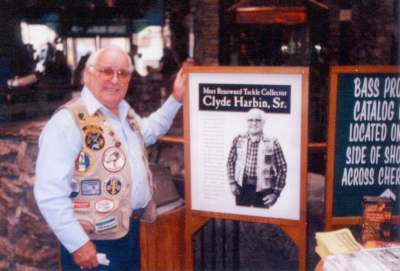 Mr. Clyde A. Harbin Sr. 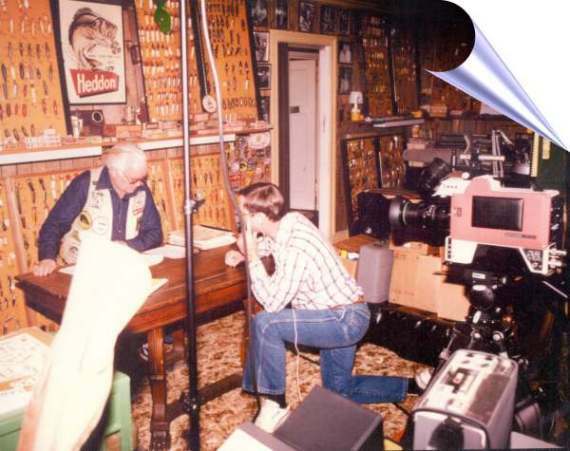 THE BASSMAN (left) along with Phil Smith (right) of Phil Smith Productions setting up to Shoot Their First Video Tape on December 15, 1986. Antique Lures and Collectibles: An Overview *** This videotape contains a variety of antique collectibles for all members of the family. They include fishing rods, reels, patches, gadgets and of course antique lures. Antique Lures: Over 40 of the Rarest *** This videotape is for the curious and serious antique lure collector. The BASSMAN takes a close up look at more than forty of the rarest and hardest to find lures in the country. Antique Lures: The Heddon Collection *** This videotape contains a brief summary of the Heddon/Stokes heritage from the early 1900's to the present. Mr. Harbin gives us a rare look at the most extensive Heddon lure collection anywhere. Antique lures: Heddon/Stokes Heritage *** This videotape contains the early history of the Heddon lure company. Mr Harbin has traveled hundreds of miles and spent many months compiling information on the Heddon/Stokes family from their early days in Mohawk, Florida at the Jolly Palms Resort of the 1900's. The video also takes a rare look inside the Heddon factory in Dowagiac, Michigan. Heddon Uncataloged Lures *** This videotape contains lures never catalogued by the Heddon lure company. They include some of Heddon's rarest lures including the elusive Moonlight Radiant, The Woodpecker, Red Headed Luny Frog and the Baby Black Sucker. Many of the lures were special orders and were never included in the company brochures. This video is a must for any serious Heddon lure collector. 1903 - 1916 Heddon Catalogues *** This videotape contains many of the lures that were catalogued by the Heddon lure company. The tape opens with the very rare and early, Single Lure catalog of 1903 and includes information on lures introduced by the company from 1903 - 1916. 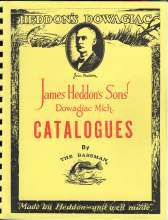 Many of the catalogues are in color and contains valuable information for any collector of Heddon lures. Heddon/Pradco Lure Collection I and II *** This two set video contains a very rare and unique look at the lures in the archive collection now under lock and key at the PRADCO Co. Mr. Clyde Harbin and Lanny West, take the viewer through 100 plus years of Heddon lures. These tapes include the 1860 handmade Ice Decoy by Richard Heddon, the father of James Heddon. Heddon Historical Footprints *** This latest released video covers much of the Heddon Heritage. There is Bee Keeping information, Jeanette Hawley, Abbey & Imbrie, VL & A, EDW K. Tryon Co. information, Box and early Rod information along with much more Heddon information. This video relates to The Heddon Historical Footprint book and has Heddon information that has be discovered after the Footprint book was printed. This video serves as an update video for The Heddon Historical Footprint book. Special Notice - " The Video Tapes are no longer in production. Phil Smith & Clyde Harbin appreciated each tape purchased". Contact >>> rcollins@basspro.com >>> Mr. Rick Collins, Wildlife Operations Manager, Bass Pro Shop, Springfield, Mo. for information of Bass Pro Shop's production.